Today's poetry title is a real treat. I have never encountered a tale quite like it, and am delighted to share it with you. The narrative is told using a series of haiku, which just happens to be a poetry form that I really love. In the tale we meet a young girl who goes on a voyage of zoological discovery with some friends. Together they see and experience all kinds of wonderful things. Piratess Tilly has formed a family of sorts, and together they sail “the high seas” seeking out knowledge about the natural world. With her are seven boys who hail from seven countries, and then there is Yuki, a koala that she rescued from Australia. Inspired by the work of Charles Darwin and Beatrix Potter, the young naturalists set out on a voyage of discovery using an heirloom compass and nautical charts. Up goes the mainsail and with Tilly at the helm and Yuki and his map beside her, the crew of the Foster set sail for the Galapagos Islands. Many days travel lie ahead of them and Tilly takes the time to do research and create sketches. Finally land is sighted! Humpback whales breach in the ocean and Blue-footed boobies fly overhead, their “beaks full of fish.” The adventurers see marine iguanas and sea lions, and happily study sea life in the blue waters of the ocean. Then Yuki sees something that upsets them all. Pirates are stealing baby giant tortoises! The friends decide that they have to rescue the little reptiles before it is too late. In this delightful picture book, gorgeous illustrations are paired with carefully crafted haiku to take young readers on an adventure during which they meet avid young naturalists who travel the world. At the back of the book young readers are provided with biographies of Charles Darwin and Beatrix Potter, naturalists who celebrated the natural world through their writings and artwork. Every year Americans experience natural disasters. There are floods, wild fires, earthquakes, storms, hurricanes, and landslides. Homes, business, and lives are lost, and sometimes it takes the affected areas years to recover. In the 1930's a natural disaster of epic proportions struck the United States. The Dust Bowl brought misery and loss to hundreds of thousands of people, and millions of acres of land became infertile due to drought and huge dust storms. Millions of people moved to other parts of the country to get away from the devastated areas. There is no doubt that, for the people who lived through the Dust Bowl, it was a heartbreaking time. And yet some of them did not give up. They held onto their land hoping that good times would return. Today's Book of Hope takes us into the life of a young man whose whole world is turned upside down by the Dust Bowl. It is remarkable to read about his experiences, and see how, in spite of it all, he finds the strength to keep going. On April 14th, 1935, the sun comes up and a beautiful, cool, and clear morning is born. Calvin runs over to his cousin’s house and the children play together, delighting in the “hopeful day.” Alas, in the late afternoon a dust cloud blows in, a wall of blackness that blots out the sky and the sun. Calvin cannot see where he is going as he heads home, his hand on a fence so that he does not get lost. Not that long ago Calvin got to enjoy clear skies, rain, and the sight of golden wheat ripening in the fields. He got to enjoy seeing his mother’s pretty smiling face, to drink milk that wasn’t gritty, and to sleep on a clean pillow every night. Then, four years ago everything changed when the rain stopped and dust storms scoured the land. Crops withered or were eaten by hungry rabbits, cattle had to be sold before they perished, and children started dying of dust pneumonia. Year after year Calvin’s dad said ‘“Next year it’s gonna get better,”’ but it hasn’t got better. Worn out by disappointment and heartache, Calvin’s dad is desperate, and so Calvin sets about learning everything he can about better methods of farming. Perhaps if they change their practices the land will heal and the rain will come back. Perhaps he can save the farm in spite of everything. 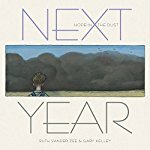 This powerful picture book brings to life what it was like to live through the dust bowl years on a farm that was affected by this appalling natural disaster. We are witnesses to the suffering that Calvin and his family are subjected to, but we also witness the way in which Calvin does his best to bring about change. Somehow he clings to hope, even when everything feels hopeless. Throughout the book a lyrical text is paired with beautiful artwork to give readers a reading experience that is both deeply moving and memorable. I love to review books that contain stories that celebrate books and storytelling. Today I bring you a picture book that appealed to me on so many levels. It is about how stories are crafted, it features a ukulele playing octopus ( I play the ukulele so I am drawn to stories that feature ukuleles), and it also looks at how dreams can come true. What more could one ask for. You may imagine that stories come into this world half or even fully formed, but this is not the case. All stories start the same way, with a blank page that has nothing on it. So, you have a whole load of nothing to begin with. You begin building a story by finding a character; one that will excite you, and one that will encourage you to develop your story. You could chose to write about a little girl or a cute little white rabbit, but an octopus who plays the ukulele would be even better. Now, the next thing that you will need to do is to figure out what your main character wants. The octopus could want a sandwich or a friend; these are perfectly reasonable things to want. Or it could want a “shining purple spaceship capable of intergalactic travel.” That would be a great thing to want, because a spaceship isn’t the kind of thing that you can just pick up in a local shop. The octopus is going to have to build the spaceship. The problem is that this particular octopus, though it is can play the ukulele, is not skilled when it comes to building a spaceship. Perhaps what the octopus need is the help of a friend. Let’s bring that cute little white rabbit into the tale to see what he can do. It turns out that whereas sweet white bunnies do indeed make excellent friends, it does not follow that they are rocket scientists. Not surprisingly the ukulele playing octopus is now feeling very down and one could even say it is “despondent.” At this rate it is never going to be able to travel to distant galaxies in a shiny, purple spaceship. The wonderful tale in this book is a joy to read. At first it seems to be about how stories are created from nothing, but then you realize that it is also about how dreams can come true, even when ones dream seems to be hopelessly unattainable. In the story there are delightful touches of humor, a narrative that is full of surprises, and a loveable main character - an octopus who plays the ukulele is irresistible. This book celebrates the creative process and the hopes that make dreams come true. The events in Charlottesville last weekend left many people feeling very angry, upset, and discouraged. How, they ask, is it possible that there are still such enormous divisions in our country? Why are so many people fueled by hate instead of compassion? 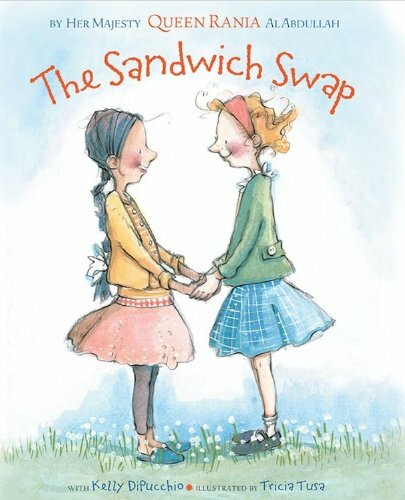 Today's book shows to get effect how two school girls discover first hand how prejudice can change the way they see a person. They discover how important it is to think about your feelings instead of blindly reacting to them. Lily and Salma are the best of friends. At school, they draw together, play together, and eat lunch together. The girls are so much alike, except that they eat very different foods for lunch. Salma has a hummus and pita sandwich, and Lily has a peanut butter and jelly sandwich. Salma thinks Lily’s lunch looks “strange and gross,” and Lily thinks Salma’s lunch looks “weird and yucky,” but both girls keep their feelings to themselves. That afternoon the girls avoid one another, and the next day they don’t have lunch together. Worse still, some of the kids in school are supporting Lily, while others are supporting Salma, and a state of war reigns in the lunchroom. Then, to Lily and Salma’s horror, a food fight breaks out. How did their silly disagreement create such an unfortunate situation? It is all too easy to negatively judge people who are different simply because they are different. With their wonderful story, Queen Rania Al Abdullah of Jordan and Kelly DiPucchio explore the idea that the first step towards tolerance and understanding is to have an open mind and to be willing try new things. All too often, people decide that something is “yucky” without even trying it. They decide that a person is “weird” because they look and sound different. One hopes that many children and their families will read this picture book, and take in the important message it contains. I am very lucky because I have wonderful friends and family members who are kind and patient, and who support me when I am feeling sorry for myself because of my health issues. I mostly manage to stay cheerful, but sometimes I get crabby and fussy and that's the truth. In today's book you are going to meet a hare who is being whiny. There really is not other way to describe his behavior. Luckily, the hare has a wonderful friend who puts up with his annoying behavior. Up to a point. The hare, unlike his friend who is doing his best to keep busy by baking some muffins, goes on to whine and fuss about the rain. He even goes so far as to kick a chair in a fit of pique, which of course hurts his toe and makes him cry. Then the hare goes too far. He accuses his friend of not caring, which is clearly not the case. The bear has been very sympathetic and patient, but now his patience has reached a breaking point. Soon the hare finds himself out in the rain where he is introduced to a creature whose life is considerably less pleasant than his own. It is all too easy, when things are not going our way, to become ungrateful and grumpy. In this book readers will meet a hare who takes his rainy day frustration a little too far. Children will laugh as the narrative in verse unfolds, and they will appreciate the comical ending. Losing someone or something that you love is never easy. In today's Book of Hope you will meet a little girl whose favorite tree gets sick. She has to go through the painful process of letting it go, but then she finds something that offers her hope that perhaps all is not lost after all. Alice and her family love the big oak tree that stands across Far Meadow. They can see it from their house, and it has been there for as long as Alice can remember. Alice has had countless picnics beneath the tree, heard lots of stories under its leaves, and she has napped with her dog Cinco on the cool grass in its shadows many a time. Now something is wrong with the oak tree. Someone has poisoned it and the tree is very sick indeed. The whole community pitches in to try to save the tree. The poisoned soil is taken away and is replaced with clean soil. The tree is shaded with sunscreens and the leaves are washed. Get well gifts are sent. There comes a time though when Alice has to accept that her beloved tree is not going win this fight and she feels as if her heart is going to break. Then she remembers that she has a treasure sitting on her dresser in her bedroom. Perhaps there is some hope after all. 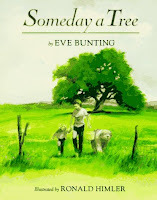 In this picture book Eve Bunting shows her readers that a tree is not just a piece of wood with some leaves stuck to it. It is a beautiful living breathing thing that provides all kinds of creatures with a home. Trees also provide people with a place to meet and play, they give families memories and stories, and when something happens to them, their loss is often keenly felt. The strong environmental message in this evocative picture book will help young readers understand that what we put into the earth greatly affects plants and animals. She tempers her message by giving her readers hope. Though Alice cannot save the tree, she can do something to honor its memory in a special way. I don't come from a big family, and the family members I do have are spread out all over the world so I don't see them very often. I often wish my cousins, uncle, and mother lived closer so that we could get together every so often. Thankfully I had a growing adopted family in my town and so we get together on a regular basis to spend time together. There is nothing quite like these times, when I look around my dinner table and see the faces of the people who are near and dear to me. Today I bring you a poetry book that tells the story of a family reunion. We meet the family members and share in their special day from start to finish, and the experience is a delightful one. It is August, and sixty-two members of a family are going to be gathering for a family reunion. The night before the big day a little girl and her parents anxiously look at the television to find out what the weather will be like. Will their grand and much anticipated reunion be washed out or will the sun shine? The next morning the sun is out and everyone heads for Small Park, which is not small at all. They come laden down with toys, babies, food, chairs, and grills. Pulling wagons and holding onto the hands of toddlers they come. The family members have come to the park by bus, airplane, car, train, wheelchair, and every other conveyance that you can think of. Bobby goes under the table where the five grandmas are sitting and yells “Yo, Grandma.” Naturally all five grandmas look up and try to find the source of the call. This is the fourth time that Bobby has played with particular trick on the grandmas and every time he laughs. Cousin George is an altogether different kind of person. He is not a trickster or a joker, he is an arguer. He will argue about anything and everything just for the sake of it. He insists that a dandelion is a daisy, and that a Pekingese is a poodle. When he insists that an insect is cicada and not a centipede he gets Max so angry that Max puts the insect down Cousin George’s back. Now Cousin George is too busy wriggling and jumping around to argue with anyone. This wonderful collection of poems allows us to share a special summer day with a very large, colorful, exuberant, and interesting collection of people. A meal is eaten, games are played, and in the end the family members are left with a glorious memory, and a family photo, that they will cherish for years to come. In today's Books of Hope title you will meet a character whose life is quite miserable and hopeless. In her world people like her are rejected by society and their prospects for a happy life are few. Then something unbelievable happens and she is given the opportunity to change her path; if she can learn to adapt and grow. When we first meet her the girl is a cowed, filthy little person who is taking refuge in a dung heap where there is warmth. Homeless, unwanted, and unloved, she wanders from village to village, often persecuted by the village boys, frequently hungry, and always aware that she is a nothing and a nobody. By chance the girl asks the village midwife for a piece of bread which the midwife, Jane Sharp, agrees to give her if the girl will do some work for her. The arrangement becomes a permanent one. The girl - whom everyone calls Beetle or Dung Beetle - cleans, cooks, collects and prepares herbs, and works hard for the midwife. In exchange she has shelter and adequate, though never quite enough, food. Over time Beetle gains confidence. She discovers that under all the dirt she is not an unattractive girl, and that she has curly hair and pretty dark eyes. She decides that she will no longer be called Beetle and names herself Alice. Quite by chance Alice is the only person available when one of the village women needs helps delivering her baby, and though the ordeal is a long and hard one, in the end Alice brings a healthy baby girl into the world. Alice is now ready to think that she can do anything. Perhaps she too can be a respected and valued midwife one day. Then alas, Alice has a setback and because of this event Alice begins to think once again that she is a nobody who has nothing to offer. She has yet to learn that life is full of setbacks and that her only hope is to keep on trying no matter how many times she is challenged. In this powerful, often touching, sometimes humorous book, Karen Cushman once again takes her reader back in time. In this instance we visit to a medieval English village where life is hard, and where a homeless orphaned child has a very hard time finding a place she can call home. Alice has to earn the respect of those around her, and she also has to figure out what she wants to do with her life. 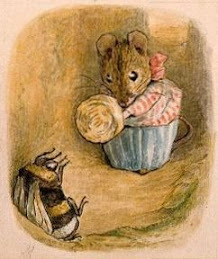 Is she Alice, the Midwife’s apprentice, or is she Beetle, a lonely little waif who takes what life throws at her?